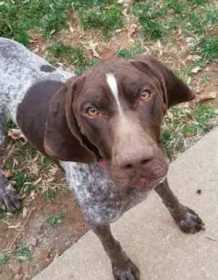 Ruger is a Male German Shorthaired Pointer non neutered friendly dog. He has a blocky head and is liver roan in color with a white marking on his face. Please let me know if you have seen him.